While it’s likely something that Facebook has always used as part of its advertising platform, Facebook have this week unveiled something new to advertisers called “relevance score”. In what seems to be something very similar to “quality score” from Google PPC data, Facebook will soon be showing advertisers a predicted score rating of their adverts out of 10. 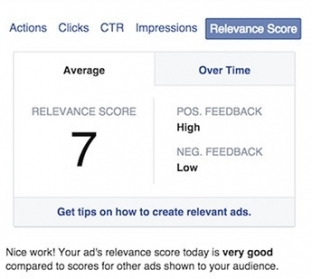 Crucial, here, is that Facebook say relevance score will affect the cost of the adverts. Now, this is likely what happens already (in fact, from experience I’m as good as certain that’s the case) but things are a fraction more transparent now, as Facebook are giving advertisers a black and white rating of their adverts. Part of it that is interesting is the idea that Facebook will be giving people an early relevance score before the advert even goes live. This suggests it will be drawing on trends based around previous adverts and data is has. All well and good, but I speak from experience when I say Facebook’s predictive models (about required cost per click and other data when setting up an advert) can often be wildly inaccurate. But “relevance score” offers a new word into the Facebook advertising lexicon. Quality score has been well known in PPC, and now Facebook has shown their hand in creating something that is essentially the same. Both systems work by weighing up the bid against the quality score. The theory being that two adverts with the same bidding, the one with the higher quality score will be shown. That, to a point, will still work if the advert with the higher quality score has a lower bid. What’s also interesting though is that there will be a feedback loop. Facebook will take into account the frequency of clicks, as well as the frequency of report as spam and hides that an advert gets. Again, chances are they are already doing this, but it serves as a reminder or introduction to the idea that Facebook will be pushing your advert in part based on how well it is performing. All in all, “relevance score” will probably change very little about we use adverts, but it will likely be something that soon becomes a “buzz word” for good advertising. Something people can cling to when an advert is running – will we start celebrating an “8”? Who can get the perfect “10”?